Mala beads are a simple yet powerful string of prayer beads that Buddhists and Yogis have used for hundreds of years to count mantras and prayers with. Japa is the meditation technique used with mala beads to calm the mind and summon your soul. Worn as a bracelet or necklace, mala beads also serve as a powerful reminder to be in the present moment. We have been handcrafting our mala prayer beads with semi-precious gemstones, hand-carved bone, rudraksha beads, sacred woods and hemp tassels since founding our company in 2004. Our unique gemstone malas are “designed by an artist and strung by a yogi.” We offer both 27-bead mala bracelets and full 108-bead mala necklaces for sale. We also import inexpensive Buddhist malas and Hindu prayer beads from India and Nepal. All of our beads are purified and blessed before we send them off to you! Our Bracelet Malas are made with 27 counting beads and are designed to be worn comfortably around your wrist. Our full mala beads are made with 108 mantra meditation beads and work best worn as a necklace. Our healing gemstone malas are handmade in the USA with beautiful and potent semi-precious gemstones. We sell a selection of high-quality Hindu, Tibetan and Buddhist prayer beads imported from India and Nepal. Our meditation beads have been crafted to be highly potent for spiritual work as well as mind-body healing. The conscious combination of high-grade gemstone beads with suggested mala mantras create a powerful synergetic force for healing, meditation, and well-being. We list the physical and energetic properties of the gemstone beads as well as suggested mantras for each of our malas. Check out our gemstone healing properties page to learn more about the power of these beautiful beads. We are always seeking out new gemstones and creating new mala bead designs. Below are our nine most recent mala creations! Please check out our entire mala collection or shop by 27 bead bracelet malas, 108 bead necklace malas, inexpensive malas made in India, or our healing gemstone collection. Why shop at Japa Mala Beads? All of our gemstone and wood beads are 100% genuine; we do not use any plastic or glass (or any other type of fake beads) in our malas. Some of our stones are slightly enhanced by the manufacturer (which is typical for the entire gemstone industry) but we only purchase the best quality and most natural beads available. Due to the natural materials used the color and the size of the beads we use may vary. We do our best to run our little mala company with as little impact on the earth as possible. Our mala tassels are made from eco-friendly hemp. Our packaging is 100% recyclable. We use natural materials in our mala designs. Our website’s server is 100% renewable energy powered. We have been making and importing prayer beads since 2004 and we strive to produce the most durable malas possible. We use the strongest stringing materials available and inspect our beads prior to stringing. We stand behind our products and have one of the best breakage guarantees in the business–108 days! We also provide a very affordable mala restringing and repair service. Our malas are based on traditional yoga, Buddhist, and Tibetian prayer bead designs. All of our malas have tassels, a guru (teacher) or meru (mountain) bead, and 108 (or a division of) counting beads. 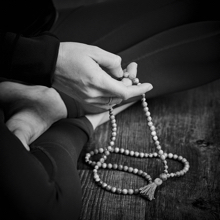 Our malas have been designed specifically for mantra meditation. All of our bracelet and necklace malas have suggested Sanskrit and Tibetian mantras listed. Using these mantras is optional, but further increases the potency of the japa practice. We also offer a custom mala design service where we work with you to create a unique mala for your specific needs. Each month we feature one of our mala bead designs with detailed information on it’s recommended mantra and energetic properties as well as a 20% coupon code. Check out our mala of the month page to see this month’s selected malas.